Westlands is one of Coloradoâ€™s premier mountain recreational and retreat properties. 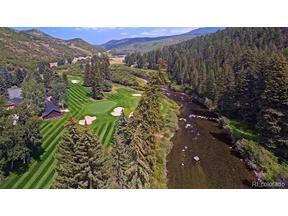 Within its 4,603Â± deeded acres is some of the finest private river fishing in the mountain states, excellent big game hunting, bird hunting, an exquisite ownerâ€™s home and guest quarters, extensive support buildings, four hole Greg Norman designed golf course, tennis court and immaculately maintained grounds. Located in the treasured White River valley in Coloradoâ€™s western slope near Meeker, Westlands has hosted many distinguished guests, from CEOâ€™s of large corporations to well-known dignitaries, political figures and celebrities. Westlands has been carefully developed and nurtured over the last 30 years by its owner who has spared no expense and whose fine eye for detail has created a family and business retreat that is unrivaled.